Convection Oven Granola calls for a little wheat germ and egg white to help it clump. Preheat the convection oven to 275 degrees F. Line a heavy, large rimmed cookie sheet with parchment paper. 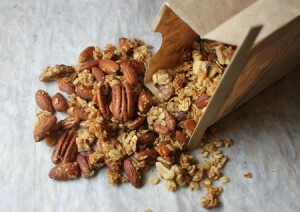 In a large bowl, stir together the rolled oats, almonds, pecans, walnuts and wheat germ. Toss in salt and stir to evenly disperse salt. Pour the egg white over the oat mixture and stir well. Bake for 35 to 45 minutes in the convection oven stopping to stir every 15 minutes. The granola should be nicely browned, but still kind of soft when you take it out of the oven. It should crisp up as it cools.